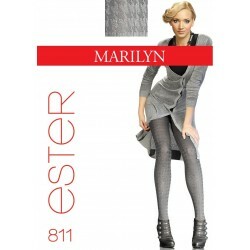 Add some elegance to your classic style with this sheer pantyhose with a back-seam pattern. The faux back-seam pattern is made in different colors than the rest of the fabric: black with a dark gray seam, and beige with a bronze-colored (Glace) seam. Key features: sheer to waist, flat seams, comfort waistband, and a cotton gusset. Add some elegance to your classic style with this sheer pantyhose with a back-seam pattern. The faux back-seam pattern is more fun than straight seams and is made in different colors than the rest of the fabric: the black pantyhose has a dark gray seam, and the beige one comes with a darker, bronze-colored (Glace) seam for a better contrast. Please note that the back "seam" starts just below the gusset level and stops at about middle of the heel. Key features: sheer to waist, flat seams, comfort waistband, and a cotton gusset.